School has already started for kids in San Diego. If you failed to find the perfect lunchbox for your little one or if you prefer to use brown paper lunchsacks, you might like this idea from Martha Stewart. 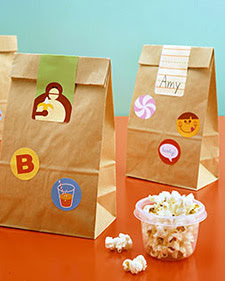 Make your own sticker lunch labels or print the designs Martha offers you. All one needs is a color printer and white sticker paper...simple. and fun. It's the cooler version of a lunch note. I love it! And I would definitely have so much fun preparing a lunch for the next morning.